And a very attractive bar it is. The wood used for the counter and some of the walls was reclaimed from a barn in Idaho. The chairs are antique metal cafe chairs in a kaleidoscope of colors. The owner, David Brodsky, says he found some of them on eBay. The restuarant is sleek and modern, with clean lines, but very comfortable, too. I think of it as cozy contemporary. And I really like the big communal table in the center of the eatery. I’m nearly always disappointed in Margherita pizzas at American restaurants. But, ever the optimist, I ordered the From Scratch version. Well, it turns out that the pizza really is made from scratch. And that includes even the flour, which is ground from organic hard spring wheat berries on the premises in a wooden Austrian flour mill. 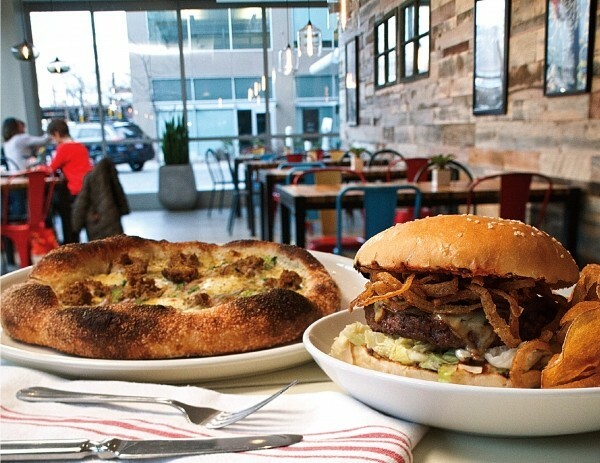 The sourdough used for From Scratch’s pasta and the cornmeal used for pizzas is made in-house. So is the hand-pulled mozzarella, and even the butter and jam. Well, about that Margherita ($13): It was magnificent—easily the best wood-fired pizza I’ve eaten in Salt Lake City. It’s simple, nothing more than that fresh-made flour, housemade mozzarella, Bianco de Napoli tomatoes and fresh basil. The crust was glorious: nicely puffed, with lightly charred dough bubbles around the edges, just the right amount of sauce, and mozzarella melted to perfection. The secret to pizza-making at From Scratch is, I learned, that they cook their pizzas at a much lower temperature than most wood-fired pizza places—about 450 to 500 degrees. This allows the crust to cook to perfection and the cheese to fully melt. Another pie—this one with housemade fennel sausage, mozzarella, red and green onions, and creme fraiche ($15)—was equally stupendous. On my third visit, I ordered the risotto cake again, and this time it was perfect. The kitchen either listened and heard my complaint, or the over-salting was just a fluke on a very busy night. A couple of other great From Scratch dishes: the pumpkin-stuffed homemade ravioli in brown butter ($16) was outrageous; unfortunately it’s since been taken off the menu, with pumpkins now out of season. The biggest From Scratch surprise, however, was the Scratch burger ($13). As with the Margherita pizza, I don’t know that I’ve ever had a better burger. It’s a huge, juicy beef patty topped with Gold Creek Farms smoked cheddar, shoestring onions, lettuce and housemade ketchup, with a glistening, sesame-seed bun that’s made, of course, in-house. Be sure to also ask for the housemade mustard!